Do Large-Scale Graphics Really Boost Sales? Survey says YES. We don’t even have to imagine the value, researchers have done the hard work. According to a 2012 study published by the Sign Research Foundation, sign changes generally had significant, positive impacts on sales, number of transactions and profits. Roughly 60 percent of businesses across industries surveyed reported sales increases averaging about 10 percent. 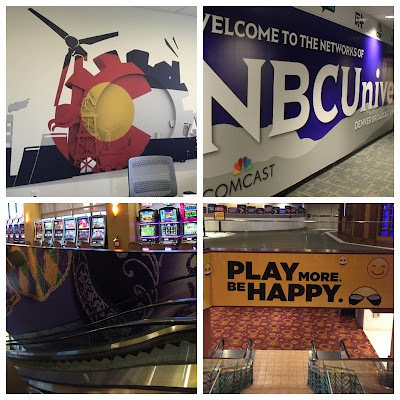 Let SpeedPro Denver create colorful, bold large-scale wall signs for your lobby, factory, hallway, retail outlet, windowless conference room, lunch room, casino, or movie theater. Anywhere there’s a blank wall there’s opportunities to reinforce your brand and key messages. And, no expensive framed artwork is needed in our fast-changing world. 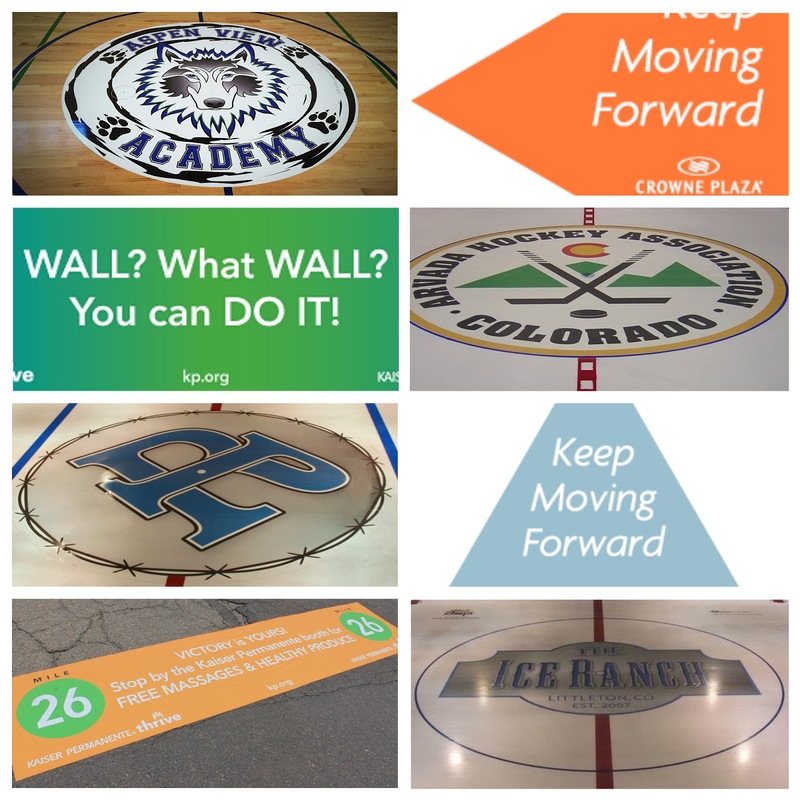 Custom large scale wall signs, canvas prints and floor graphics are all affordable and can serve as part of any cohesive interior design. Research conducted as recently as June 2018 indicates a positive correlation between employee satisfaction and their work engagement. Take it a step further and include employees in the plans and decisions around wall murals in their workspace. 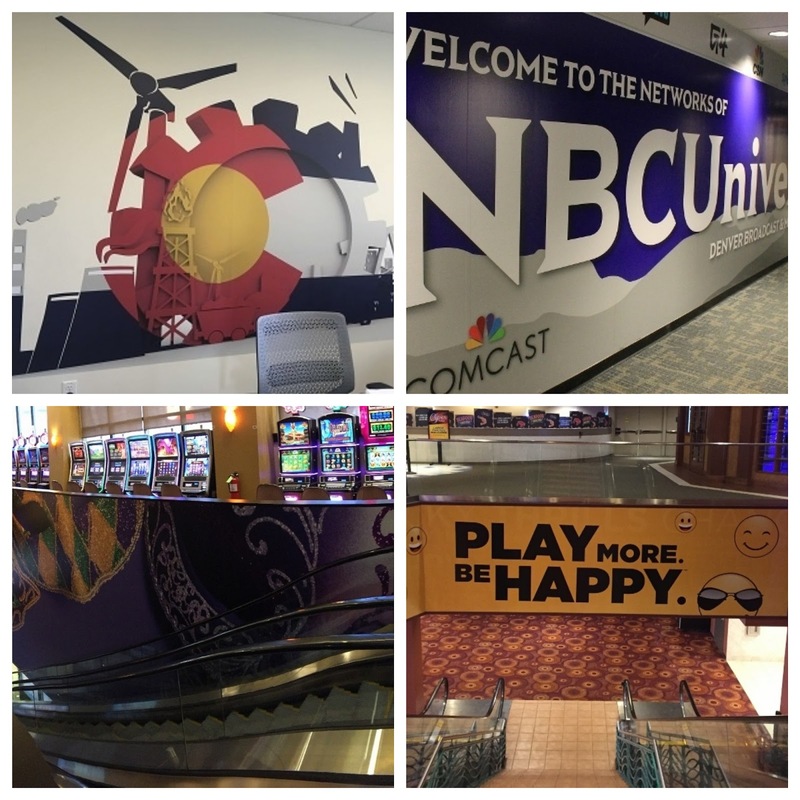 SpeedPro Denver has lots of vivid portfolio examples of great big wall graphics we've handled to give you some ideas for your location. 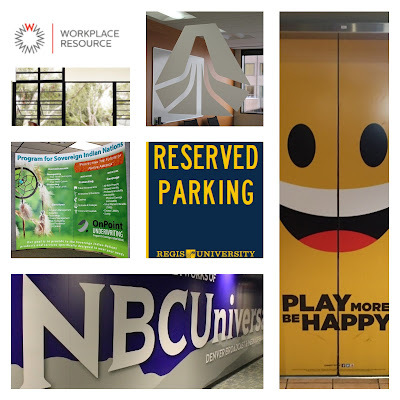 We’ve worked with hospitals, schools, corporations, advertising agencies, casinos, real estate companies, lawyers, and shopping centers among many others to visually add interest to lobbies, conference rooms, retail outlets, hallways and cafeterias. We're happy to check out anysite and give recommendations! The working theory for many years was that wind vents would reduce the wind load on any given banner. In other words, wind would blow threw instead of pulling on and possibly tearing the banner. This theory was so widely accepted that some governments made vents mandatory for banners installed in certain locations. Springville, Utah went as far as to regulate that at least 20% of the area of a banner must be made up of holes. Scrim: Commonly used for outdoor signage since it is scratch- and water-resistant but can be penetrated for grommets for easy hanging. Scrim banners are made of vinyl and reinforced with polyester cording. The material construction is what gives it strength and durability. 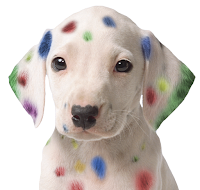 Its smooth, flat finish makes this surface ideal for large-format inkjet printing. Heavy duty: Ideal for fluttering flags that will go with the wind instead of fighting it, this vinyl substrate has high tear resistance due to the multi-layer design. Typically hemmed and with grommets, it is also ideal for prints that will be inserted into re-usable stands to announce the current sale or holiday specials. To read more about the research referenced in this story, click the link below. check out our Studio News and view our extensive portfolio! Large format printers produce a lot more than trade show properties! Banners for the sponsorships, trade shows, industry events, and the company picnic—hanging and re-usable retractables. Scrim banners are commonly used for outdoor signage while smooth banners present crisp images--even up close. Let us know the setting, and we’ll recommend the right material. Canvas prints–line the hallways with artwork, no framing necessary! An affordable option for even the smallest business, canvas prints have a soft feel and look. Door signage–quick identification for the conference rooms, access restricted, supplies, you name it. Choose a substrate that will stay up for years or one that can be easily removed. Easel prints–for the lobby to welcome guests. Customized messages printed quickly and inexpensively add sophistication to welcome VIPs. Elevator wraps–entertain and inform employees and visitors. Still a novelty, use this space to reinforce your brand and key messages. Employee of the Month or Reserved parking space signs that hold up in the elements–visually reward your best employees. Printed on substrates such as Max-metal, signs will stay up weather the elements for years. 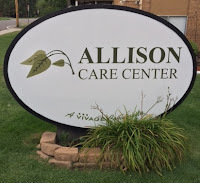 Exterior signage of your logo in full color—be easy to find and memorable. 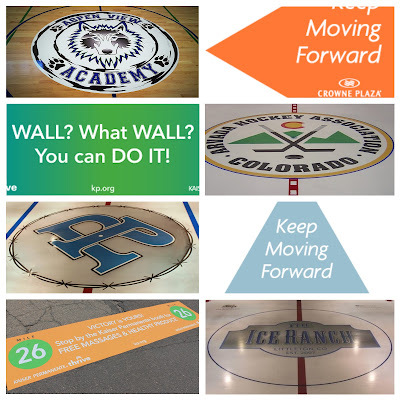 Options range from single block lettering to wall murals to 3D treatments. 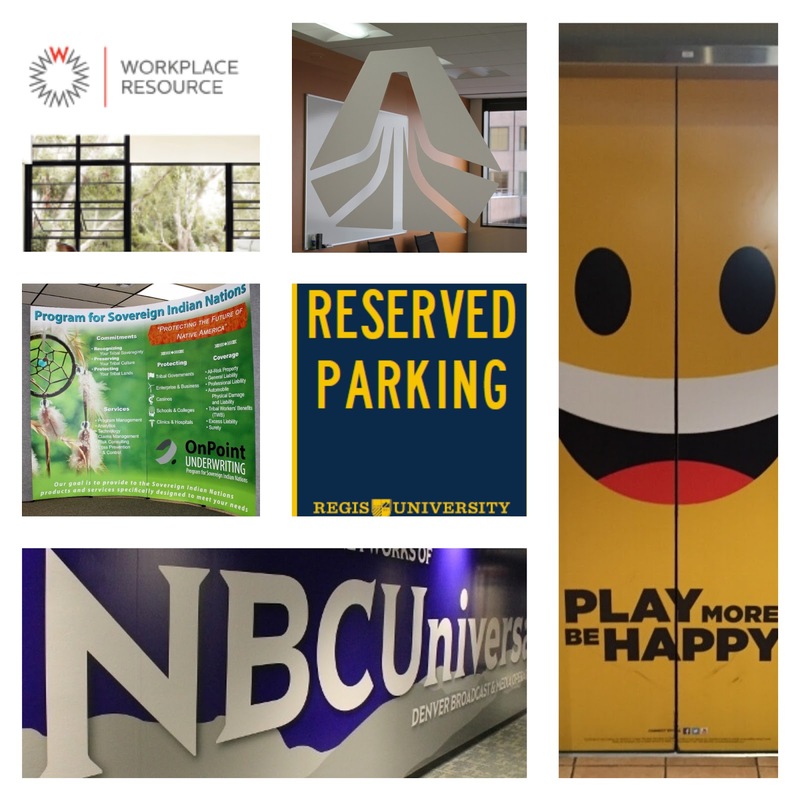 Lobby, interior and conference room windows with your logo full color or frosted—reinforce your brand. Window film such as Glass Adhere is removable and reusable but can also stay in place for years. Seasonal graphics for the lobby and lunchroom—bring color to a typically sterile setting. Thin poster boards that can easily be hung and removed from most surfaces are affordable and fun. Visuals for the big sales meeting–podium signs and posters in any size. Your speakers will appreciate the chance to customize messages and your audiences have come to expect it. Tents and flags–create shade to show you care about your employees. Fluttering flags are fun and eye-catching. Tents for outdoor events can be nearly any size; cover your trade show table or a crowd of hundreds. Vehicle wraps or decals–for your sedans and vans. Simple decals can be designed and strategically placed to make an impact while telling the world you a small business but ambitious! Full wraps are custom to show off your brand and convey your market position. Wall murals–reinforce key messages and add visual interest to a space. For longer-term placements, wall murals can be any customized graphic, familiar scenery or as simple as big arrows pointing the way. Window graphics–add color, fun and deflect birds. Pull in traffic with the latest specials or shield your interior space with engaging visuals while letting in light. to talk about your large format print jobs. We provide free estimate and will come to you. News & Awards on our website and view our extensive portfolio! Why follow the yellow brick road? Because it visually pulls you in! Create your own yellow brick road to . . .
to talk about your large format print jobs. We provide free estimates and will come to you! 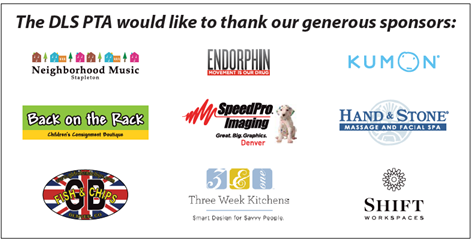 Event Printing Handled by SpeedPro from Start to Finish: ExamSoft, a Dallas-based educational software company, held its third annual user Assessment Conference mid-June in the heart of downtown Denver over three days at the Marriott City Center. Attendees were welcomed to their conference by a colorful 20' banner and a large 8' x 3' retractable banner guiding them to their event. Held on two floors of the hotel, directional signage was used to steer traffic to the variety of workshops attendees could join. 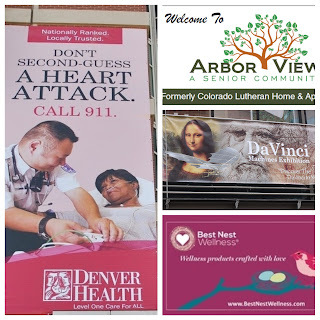 Other large 8' x 3' signs, were used to welcome them to Denver and to identify help desk locations. Table tents, networking breakfast table cards and a series of 13 different social/ice-breaker 11” x 17” signs were strategically placed around the two floors. Several 10' x 28" directional signs for the on-site café, certification, and registration desks were part of the package. Podium signs, the special conference logo printed oversized and custom-cut completed the 360 view of the nearly 75 pieces SpeedPro Denver printed, delivered, installed and took down. Zamboni’s, cars, trucks, trailers and boats--you name it, SpeedPro Denver can wrap it! 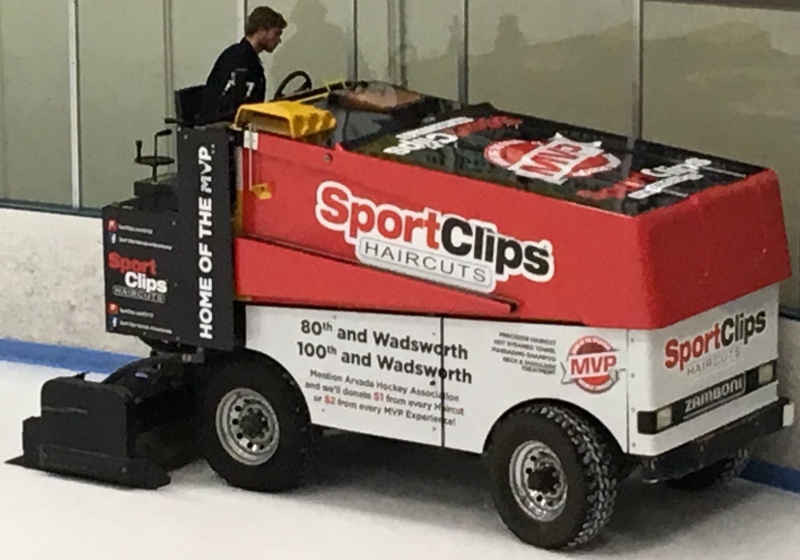 In October we wrapped a Zamboni for Apex Park & Rec’s sponsor Great Clips. 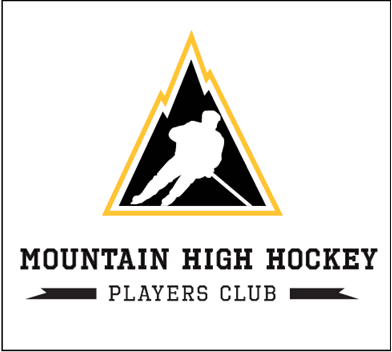 We also print ice-worthy dasher images for Apex including our own proud sponsor sign! SpeedPro Denver has started delivering fun, colorfully wrapped 40 foot buses to Boulder County! We will be printing and installing full wraps for 20 buses with four different designs. Coors Beer Promotes the Rockies on SpeedPro-Printed Banners: Tasked with printing hundreds of large format banners for Coors is business-as-usual for the Denver studio! 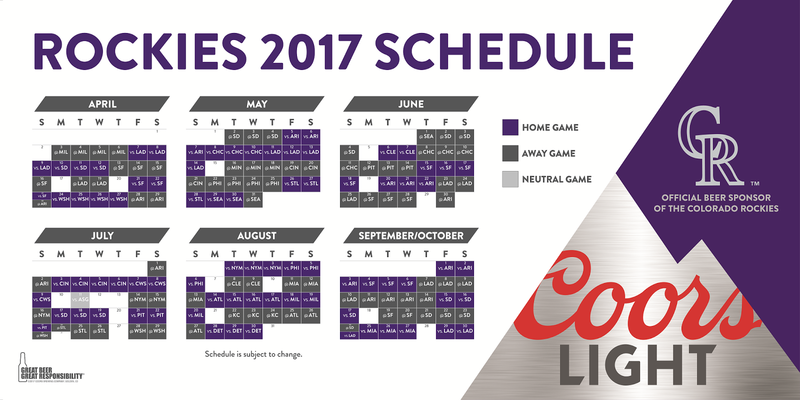 We printed 400 banners; some 10 feet x 3 feet and some 6 feet x 3 feet long promoting the Rockies 2017 season at Coors Field. National Ballpark Museum added to our client roster: The "Best Kept Secret in Baseball," the prestigious National Ballpark Museum in LoDo commissioned us to cleverly transform this VW Beetle into a baseball! Located a short half-block from Coors Field, "If you are a baseball fan in general or are devoted to ballparks in particular, you owe it to yourself to visit this nationally recognized public museum," said Joe Mock from Baseballparks.com. and view our extensive portfolio! 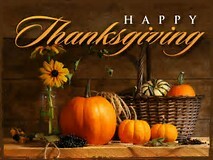 Halloween, Thanksgiving, Holidays and New Year’s! Get the feeling the universe wants us to be happy this time of year? Why else would “happy” be so prevalent in so many greetings? 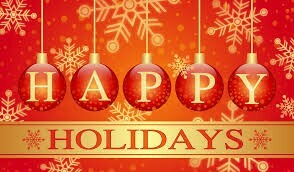 Do you decorate the business and home for the holidays? We mean all the holidays coming right up! Four happy holidays in four months is a lot. Did you know you can do them all justice with re-useable materials and affordable graphics? To celebrate Halloween, do you have a spooky bold window cling on the office door welcoming visitors and on the conference room windows to add a festive flair to the space? How about chilling floor graphics leading up to your office door guiding visitors to enter and meet their doom? At home you can soften the tone and hang a door banner on the big night drawing the little ones in without scaring them. How about vivid window clings that you can use year after year? 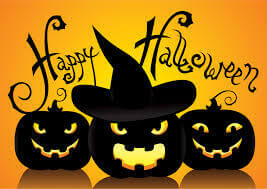 Or even more unexpected, a series of spooky street graphics drawing trick-or-treater's to your door. For Thanksgiving, the lobby could be decorated with the calm, welcoming hues of the season with something as simple as a burnt-orange desk throw with a greeting and the company logo. A big poster in the lunch room announcing this years’ annual potluck date would be a great visual reminder to participate! At home, instead of the typical door wreath, how about a door banner with a big turkey on it or a banner hanging from your front bushes to welcome family and guests? Custom table throws for your out-of-town visitors are bound to impress! We tend to go all-out at Christmas, decorating our workspace and homes interior and exterior. Your front desk could transform into a winter scene by simply putting a holiday-themed table throw over it! Add a skinny Santa in front of a "tree" made of foamcore to any smaller space to get in the spirit of the season. How about a faux fireplace to gather around and warm up the mood of the office? Re-useable window clings work for both home and office on glass and mirrors and make their own statement. New Year’s is the easiest, shiniest holiday of all! 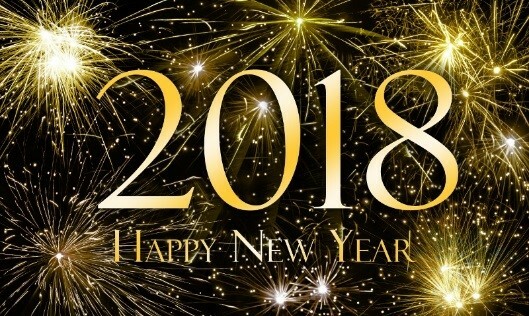 Hang an over-sized banner decorated with images of party hats, champagne glasses and lots of confetti heralding at the office and then take it home! How about a printed oversize photo collage of your favorite 2017 selfies doing fun stuff to show off to your party guests? Glass Adhere™ Window Clings: Choose outside looking in and/or inside looking out for glass surfaces or basic? You can put clings onto mirrors too! Fabric Table/Desk Throws: A colorful throw will transform your front desk and show visitors you have the holiday spirit and perk up your employees. Poster Boards: Seasonal messages such Spooky Lunchroom Potluck Today, Join Our Feast on Wednesday, and Save the Date December x for the Christmas Party are easy to store. 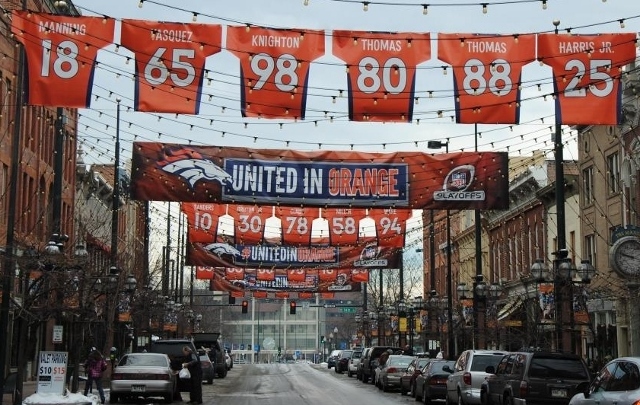 Hanging Banners: Indoor or outdoor that can be cleaned, rolled up and stored until next year. Retractable Banners: In a stand so you can change out the message anytime--they roll up and store beautifully and can be easily moved about the lobby or the porch. Magnets: Oversized to freshen up the look of your fleet or personal auto, they are easy to remove and store. Custom Foamcore Cut-Outs: Your logo sitting riding on a witches broom, your logo in a range of sizes filling a cornucopia, jiggling on Santa’s big belly full of jelly, screened behind “the” countdown clock. Floor/street graphics with images of skeleton feet, a running turkey, sled marks, reindeer feet, stumbling revelers, the could go on and on! Custom event graphics such as posters, banners and custom-cut foamcore images like your logo or a Christmas tree to stick against a wall—no messy needles to deal with! Decals (that can be removed cleanly) added to your existing wall murals to celebrate the change of holiday. Call us anytime for ideas! 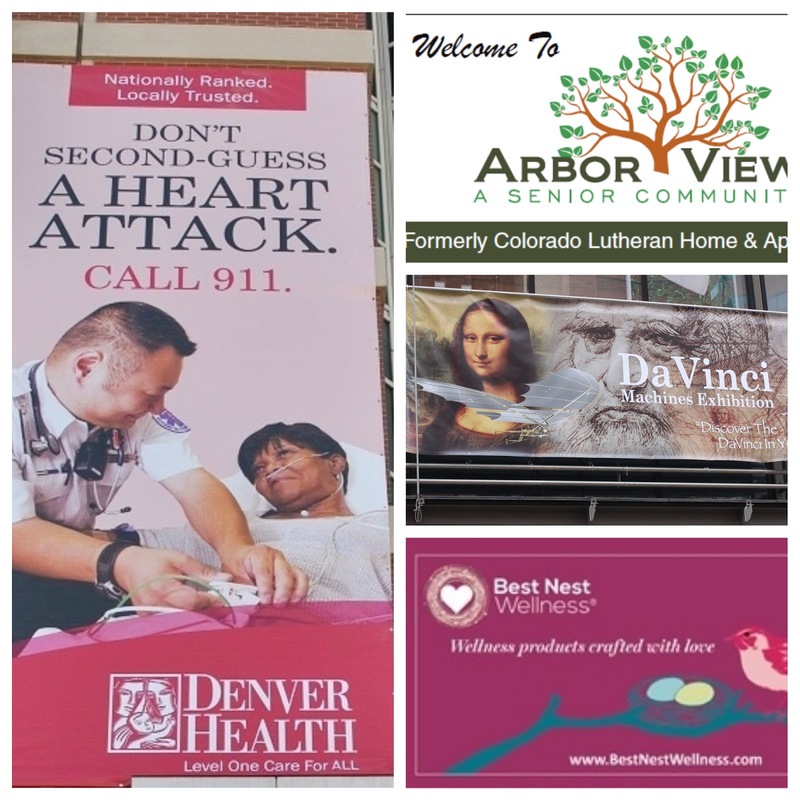 We print banners for a range of settings including trade shows, to direct school traffic, announce auto sales, tout a blue-ribbon award, herald a Bronco’s win, for concerts and fairs, to hang in bars and on light poles and sign posts, and to publicly thank sponsors or participants. Again, it’s all about context. Do you want to hang a banner outdoors that will weather the elements for a year or even longer? Is there a one-time conference that commands custom pieces? We’ve got your solution! Scrim: Commonly used for outdoor signage since it is scratch- and water-resistant but can be penetrated for grommets for easy hanging. Scrim banners are made of vinyl and reinforced with polyester cording. The design is what gives it strength and durability. Its smooth, flat finish makes this surface ideal for large-format inkjet printing. SoFlat®: Described as scrim-less since this PVC substrate doesn’t have a scrim/base fabric. It is a non-curl substrate with a smooth, flat finish. It is typically used indoors because it is not scratch- or water-resistant. Commonly used for trade show, event and conference displays, it rolls up well. You see it use for many retractable banners. Mesh: Designed to let air blow through instead of flapping in the wind or tearing, this synthetic substrate can also be hemmed for a clean look and pierced to hold grommets. You see these on construction fences and at parks touting sporting and other events. Canvas: With a texture similar to a painting canvas, this substrates has a softer feel and is “natural” on the non-print side and painted white on the print side. While not as glossy as some other options, canvas is a common choice for setting that demand a more classic look; your bank or inside hotels. Heavy Duty: Ideal for fluttering flags that will go with the wind instead of fighting it, this vinyl substrate has high tear resistance due to the multi-layer design. Typically hemmed and with grommets, it is also ideal for prints that will be inserted into re-usable frames to announce the current sale or holiday specials. 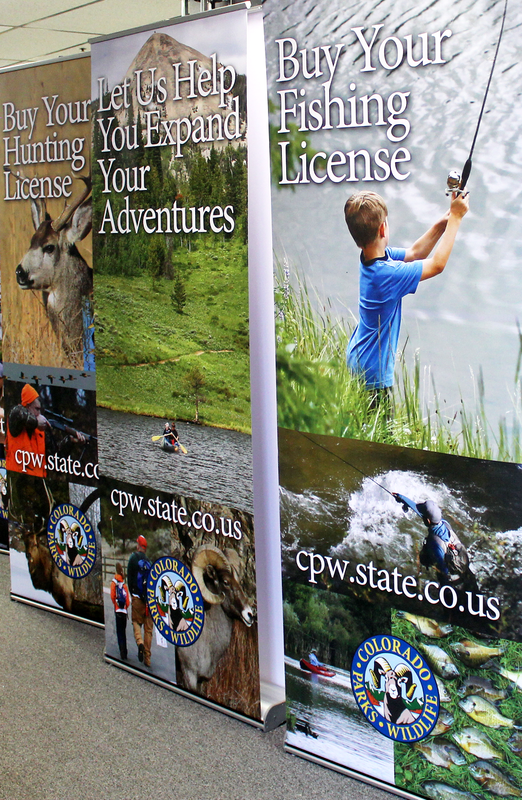 Smooth: Designed for indoor use, smooth banners are defined by their levelness that allows for pressure consistency in printing. That leads to crisp images—even when viewed very close up. Available in a matte finish and can be printed on both sides. SpeedPro Denver printed 400 banners for Coors! Topic suggestions are always welcome!